With the national holidays around the corner I decided it was appropriate to go visit some friends in Malaysia and get all lazy with pizza, movies and elastic-waist pants. Because elastic-waist pants are one of the most important things you need when you go visit your friends in Kuala Lumpur and there is some pizza involved. Ok, lots of pizza. And maybe some cake. Instead of me sitting on the couch with a good slice of Hawaiian delight I was kind of forced to climb billion steps only to go into a dark cave full with bats, and as it proudly said on one t-shirt in their souvenir shop – “The rarest spider in the world”. You guys, THE RAREST SPIDER IN THE WORLD! They didn’t specify if you will need the rarest antidote in the world in case you actually get to meet this spider. Lots of stairs and no pizza. Our journey started from KL Sentral where we bought our 2MYR train ticket to the Batu Caves. 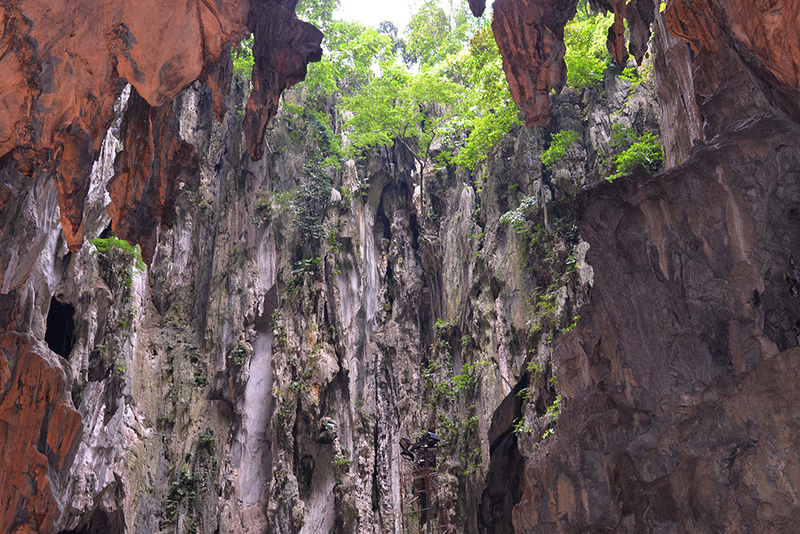 These are a limestone outcrop located just outside of Kuala Lumpur. The whole complex is made up by three caves and each one has its unique features and… well, billion steps to climb. 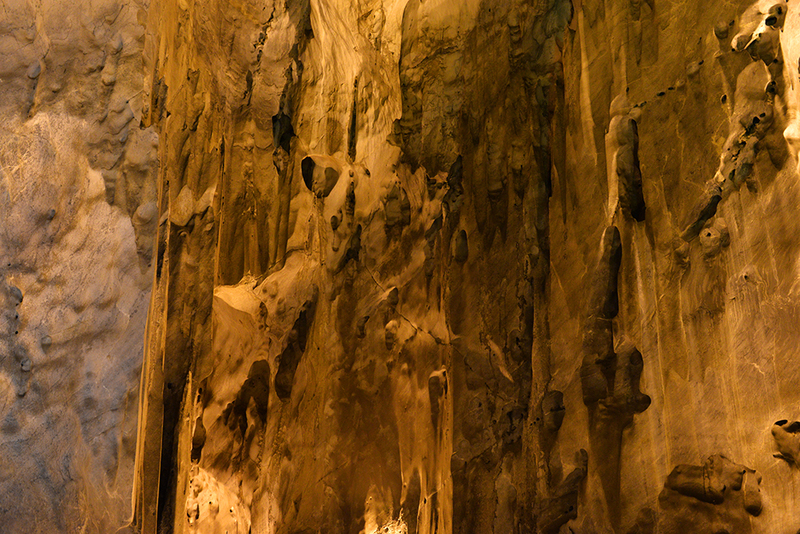 The first cave, closest to the entrance is the Ramayana Cave, which boasts gaudy dioramas of the Indian epic Ramayana. Further up the narrow but towering cave interior, past two man-made flowing streams, is a shrine to a naturally occurring linga. The cool temperature of the cave wasn’t enough to keep us fresh with all the climbing and avoiding of the tourists with more camera equipment than an average National Geographic photographer. Continuing down the street we were tempted by the sweet scent of the various Indian sweets, sold from the street stands around the caves. Because no trip to any cave would be as much enjoyable without some traditional Indian sweets. Now, getting to the two other caves was a whole lot of hard work! We had to climb around 300 steps, dodging monkeys and monkey poo in the searing heat. At the top we were greeted by more monkeys, some throwing coconuts and empty plastic bottles. In the distance I could hear people screaming and monkeys fighting. I raced up the steps, stopping for rest wasn’t an option. Unless I wanted to be dragged by the monkeys and to probably risk suffocation from the strong urine odor. Upon reaching the top platform we were awarded with panoramic views and with the fresh breeze coming from the largest cave, known as the Cathedral cave. Also we weren’t hit by any flying coconuts, which was another success story. The cave had many openings in the ceiling and there were few more animals to encounter. Like the chickens and hens who were walking freely among the tourists. Who knew chickens loved caves too. Batu Caves is easily reached by KTM Komuter train using the Batu Caves-Port Klang Route, costing RM 2 for a one-way journey from KL Sentral. Batu Caves may also be reached by bus 11/11d from Bangkok Bank Terminus (Near to Puduraya Terminus) or bus U6 from Titiwangsa. It’s absolutely alluring. I was there in 2011. 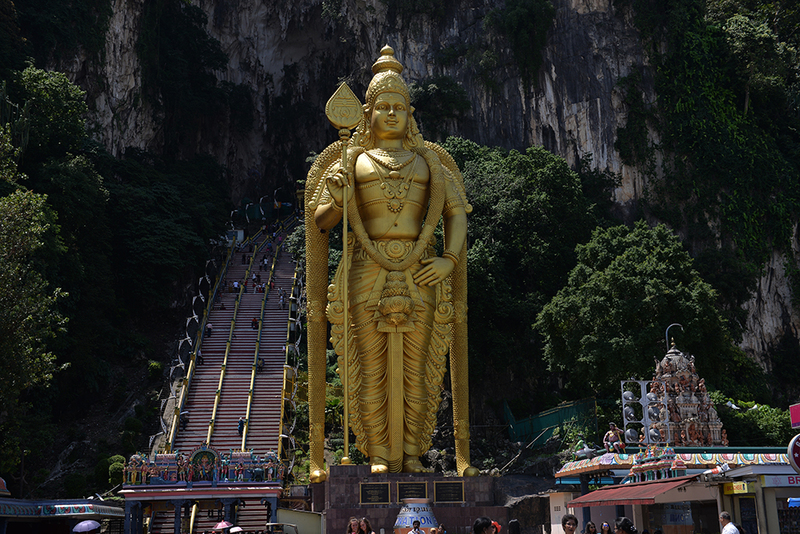 Visiting the Batu Caves was one of my peak travel experiences and one of my most memorable experiences ever! Batu was a great spot, but the commercialism was a bit much. Glad to hear that you enjoyed it!